The Chapter 7 trustee must not pay any creditor from the asset liquidation efforts until all creditors of the next higher class are paid. The liquidation of the debtor’s assets is the principal responsibility of a Chapter 7 trustee. For an individual filing bankruptcy, the primary place of residence is exempt from the bankruptcy. If the mortgage payments are not being made, foreclosure may be forestalled for a period by filing bankruptcy. Other exemptions exist as well. Certain debts, including income taxes and other obligations to the government, are not dischargeable. Many individuals do not have any non-exempt assets. The Chapter 7 trustee then simply administers the paperwork to ensure all regulations are met and the case is discharged appropriately. In simple cases, the entire process may be completed within 60 days to six months. Should assets be available, the Chapter 7 trustee must determine the best means of liquidating the assets to return the highest amount possible to each class of creditor. If the assets are clearly valuable and readily transferable, the trustee will arrange to have the property either sold or auctioned. Intangible assets are more difficult to collect and liquidate. The trustee will decide if the potential return justifies the public expense of acquiring buyers for the non-tangible property. 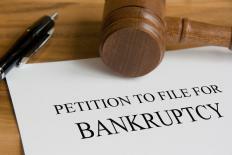 There are six classes of claimants to a bankruptcy. The Chapter 7 trustee must not pay any creditor from the asset liquidation efforts until all creditors of the next higher class are paid. To an individual debtor, these classes are of no concern. Attention by the debtor is more concentrated on those debts that are not dischargeable under bankruptcy law and to have as many debts as possible be discharged. In business cases, a Chapter 7 trustee might choose to actually enter and operate a bankruptcy filer’s business. This is an extreme step, as the trustee must find suitable management to physically run the business, while concurrently maintaining employee morale and customer confidence. The former owner cannot be forced to operate the business for the trustee. The advantage of Chapter 7 to the creditor is partial or total reimbursement of the money loaned. The debtor gets a clean slate: a chance to start over without the encumbering debt. Once a debt is discharged, the creditor may not again try to collect the debt. The Chapter 7 trustee is obligated to provide courteous, professional dealings with all parties involved and to protect the bankruptcy filer from verbal or physical abuse. What is a Government Liquidation?